One of our cats loves to venture outside of his normal outdoor fenced-in area. He is very nimble and can squirm his way out of most "normal" harnesses. 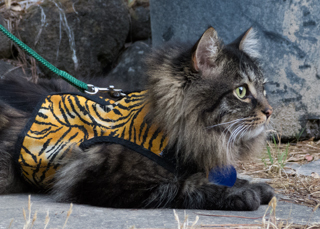 Normal harnesses like you see in pet stores are flimsy and hard to get on the cat. By the time you fuss with all the buckles and straps and so on, fluffy has just about had enough. Not so with the "Kitty Holster" from Crazy K Farm. We were already on the hunt for the perfect harness which would be easy to put on, comfortable to wear, and secure. After doing a lot of searching in stores and on the web, we finally found the Kitty Holster and placed the order. They have several styles and sizes. Once we received our new Kitty Holster we tried it on Brodie and to our pleasant surprise, he didn't mind it at all. It is very easy to attach with a couple large velcro pads. There is a large "D" ring attached to the back where you attach a lead/leash. The material is light-weight, breathable but strong. Brodie doesn't seem to give it much notice as he strolls around the yard sniffing all the "pee mail" from all the neighborhood cats and critters. I strongly recommend this safe and comfortable product to any cat-owner who wants to take fluffy on a safe cat-walk or venture out of the house for any reason.